Nepal a multi cultural multi ethnic country has many tribes and triumphs. Among them are kiratas. Suniti Kumar Chatterji, the Chairman of the Asiatic Society and a professor at the Calcutta University in India, has verified this historical fact. In the Tibetan language Nebal means “a house of wool”. The term “Kirat Desh”or Kirat Country is found in the earlier documents such as Veda and other ancient Hindu texts. The Kirat Desh extended from Himachal Pradesh, in northwest India, Nepal(central) to Tripura(east) and all the way to Chittagong in the south as mentioned in Veda and other ancient hindu texts. Today Kirat people live in Nepal, Assam and Sikkim. Interestingly there are still find mon khmer Kirat ethnic group in Himachal Pradesh. You can google ” mon khmer kirat” and you know what i am talking about. This site gives information about Kiratas civilization in the Himalayas. Secondly the Sanskrit meaning of Kirata in the first place is indigenous with phrase “kiram atati bhramati yah” meaning one wandering over the forests and mountains. Therefore the indigenous nationality of Nepal are Kiratas. G.P Singh had already identified the Newaris, Gurungs, Magars and Lepchas as Kiratas beside the usual Rai & limbu. This shows that adivasi Janajatis (Indigenous Nationalities) of Nepal are Kiratis thereby solving the issue of Unity, not ethnic, division. Keith Dowman in his work “Power Places of Kathmandu” said Legend written down in the Newar chronicles records dynasties of pre-historical, pastoral kings history and most importantly provided by archeological evidence of urban settlements, begins only with of the Mongoloid, Kirata people, who ruled the Valley two thousand years ago and formed the matrix of the Valley race. The Kiratas were conquered by southern, Aryan, invaders, called the Licchavis, in the fourth century. With the establishment of a stable Licchavi dynasty, the Kathmandu Valley entered the mainstream of classical Indian culture with a sophisticated urban society. The Brahmin priests who accompanied the Licchavis accelerated the process of “sanskritization”, which brought the mongoloid people into the Indian fold. Anil Chitrakar in his article Yalambar: King of the Kirants writes, Legend has it that Yalambar was the first king of the Kirant dynasty to rule Nepal. People also believe that the Newar name of Patan Yala is actually named after this king. Near the Patan Durbar Square, one can see the archeological site of what is believed to be the remains of this Kiranti kings palace. We have so little information on the Kirant dynasty, yet there are numerous legends and tips that lead us to the Kiranti everywhere. It seems that numerous rituals, festivals, icons and names of places that we see in the Kathmandu valley are from the Kirant period. There is a neighborhood in the northern part of Patan city known as Chyasal. It is said that here, 800 (chyasa in Newari is 800) Kiranti warriors fell to the invading Lichhavis. According to Sudarshan Raj Tiwari (Temples of the Nepal Valley, 2009) the Bal Kumari mandir of Chyagal, Patan, was originally a Kiranti temple. Apparently, there are many temples around Patan that date back to Kiranti times and are rectangular in shape. They usually house Bhairav and Bhimsen, as well as Bal-Kumari Ajima and other mother goddesses which the Kirants worshipped. They are said to have been renovated during the Malla times. Tiwari claims They are obviously designs from the Kirat domain. There is further evidence that these are of Kiranti origin as Mary S. Slusser has written: There are two sites in Patan where the Kiranti maintain traditional ties. One of these, the Siddhalaxmi temple near Tyagal-tol attracts certain Kiranti families for the annual worship of their clan god, the Kuldevata (degu devali). The other site, Tikhel, Southwest of the old city proper, Kirants recently restored a shrine in deference to their tradition that a Kirata temple once stood here. Even more intriguing than the legendary association of the Kirata with Patan is modern custom that provide a link with the Kirati of eastern Nepal, a people who are perhaps Kirata descendants. Slusser adds: What, if not some ancient association, should bring modern Kirantis of distant and inaccessible eastern Nepal to a particular temple site in Patan, or induce them to foregather. (Nepal Mandala pp 96-97). One shocking conclusion that Tiwari comes to in his book is his belief that the Jyapus are the descendants of the ancient Kirants of Kathmandu valley. He states Pottery as a traditional trade among Newars has remained the purview of the Prajapati, the Awale and the Kumah, all of whom are believed to have Kirat origins. The Kirants are said to have settled in many different locations around the valley besides Gokarna and Patan. There is much evidence of their residence in Thankot and Hadigaon (Originally Andipringga in Kiranti just as Pharping was called Phalapringga and Khopa now Bhaktapur was Khopringga). Tiwari states Here, at Dabal, the pole is raised in honour of the goddess of Andipringga. It is an obviously Kirat New Years announcement and honours both the king and the tutelary goddess, albeit in different places. The tutelary god Bhairav with his face mask, similar to that of Bhuteshwor Bhairav is believed to be a representation of the Kirat king and is also seen in various other places in Kathmandu Valley speculated to be Kirat seats of power or a palace. The similarity in place names of Tistung-Palung-Chitlang to the south of Chandragiri hills, now inhabited by the Hale and Gwa caste groups of Newars, and Chepang area, as well as the linguistic relations between the Chepangs, Newars and Kirats indicate they could have common ancestry and could be descendents of the Nagas. The Newar name for Patan, Yala, is believed to originate from the Kirat king Yellung or Yalambara, the alleged founder of the dynasty and the city. Chyasal-tol is believed to commemorate the 800 Kiratas slain in battle with the Lichchavis (Tiwari, 2001). So relearn your Nepal’s history dude. Face the facts. Kiratas history is never taught in Nepal school because the government had always been a Indo-Aryan after the modern Nepal was founded in 1769 AD. 2. just wanted Kirat history to be forgotten with times. But Kirat history in Nepal was the most important cause Kirat pave way for development of Nepal.As mentioned by the scholars above, taxation’s, city planning, layouts were started by the Kirats. Some of the city like Patan were built by Kirats. Later Lichhavis from the south after defeating Kirats only built from whatever Kirats had left. The Vishnu Purana(an ancient hindu texts) mentioned that the chatur-varna or four class social system was absent in Kirat Desh or land of Kirat in the East and the Yavanas(Greek) and Kambojas(Iranian), etc. in the West. According to the work “Nepali Rajniti ma Adhekhai Sachai”(Hidden facts in Nepalese Politics) by Gopal Gurung,many of the original Kirat religion “Mundhum” was banned during the Hindu Rana government and all sort of Kiranti documents were burned and destroy which the office used to call Jatiya nasta bivag. After the founding of modern Nepal by P.N Shah, the four Indo-Mongloid group namely Magar, Gurung, Rai and Limbu or MaGuRaLi communities were never given equal opportunities by Tajgadhari (thread-wearing) or vedic aryan government. Since the Tajgadhari group could not enslave MaGuRaLi communities, they send men from MaGuRaLi to join British Army as Gurkhas. With this the vedic aryan knew that they had absolute 100% in governing Nepal In return the British government paid the Nepal government for every Gurkha enlisted. But Tamang, another Indo-Mongloid ethnic group were not allowed to join the British Army because the Tajgadhari government wanted them to become porter in Nepal to do menial job. All this is recorded down in Muluki Ain (National Code of Nepal) of 1854 set by J.B Rana. According to this Muluki Ain (National Code of Nepal), the four Indo-Mongoloid group Magar, Gurung, Rai and Limbu were classified under “Namasine(Unslavable) matawalis (liquor drinkers)”.The same code prevented Tamangs(Indo-Mongoloid) ethnic group from joining British-India Army and any government jobs in Nepal, except as Pipa (porter) in Pipa Goswara office in Singha Durbar in Kathmandu. “Nepal: Forms and Origins of Discrimination” By Krishna B. Bhattachan. So my friend this is the Truth and Reality of Kirat people in Nepal. These are some of the history of nepal never told because for past 200+ years since the founding of modern nepal, the government had always been a Indo-Aryan people who are Hindus. These people had suppressed indigenous Kirat culture and religion. Nepal first king Yalambar fought in the Mahabharata war where he was protecting Nepal’s sovereignty. If Yalambar haven’t fought in the Mahabharata war, Nepal wouldn’t have existed today. Nepal would have become part of Greater India. Nepalese in UK has already started observing Yalambar Day from this year. Nepal need to start observing “Yalambar Day” soon. Kathmandu during the rule of the 7th Kirati ruler, King Jitedasti. During the rule of the 14th Kirat King Sthunko, the Indian Emperor Ashok came to the Kathmandu Valley with his daughter, princess Charumati. During his stay in the valley, he had four stupas built in four directions and one in the centre of Patan. Forward this to your friends, my friend. We need to correct all the wrongs that has been written in the context of Nepali history if Nepal is to progress. Many of these history are never taught in Nepalese school and those that are taught are ficious by nature. We need to be truth about ourselves if Nepal is to go forward. 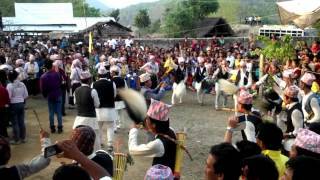 Below is the festival of Kirat which is called “Sakela”. Kirat Rai Cultural Dance "Sakela"
Sakela is the main festival of Kirat people which is celebrated twice a year distinguished by two names Ubhauli and Udhauli. of the mankind when the Kirat people were hunters and gatherers which time is immemorial. Still today, animals and birds have seasonal migratory. for good crops and protection from natural calamities during the season of April (Ubhauli) where people starts to sow crops. harvesting before the cold season start to turn in. the behavior of animals, birds, etc are performed to express gratitude to the creator. across the Himalayan region from Himachal Pradesh, Nepal, Darjeeling, Assam and Sikkim. This festival was only officially allowed in 2001 for your information. in their villages and homes. But today this festival is again celebrated and gaining popular among younger generations. I do not know where you stay, but you got to go to this Sakela festival if you have chance. I really enjoyed it this year and it was my first time i tell you.